Beyond Veggie: A secret recipe. Today my wife and my second daughter were back from Sarikei, so no more alone dinner for me. The first thing we want to do after my wife arrived was to find something to eat, early dinner. Beyond Veggie by Secret Recipe was the last choice for us, but we end up having our dinner there as all other food places in Imago KK were packed full. We had a bad experience in this place. Once we sit there for tea and order a couple snack and drink cost us RM130+. The most expensive teas we ever had. However since there were no other places, Beyond Veggie it is. As i mentioned, the price of the food in this place were so expensive. A plate of just deep fried mushroom with kewpie sesame dressing cost RM19.50 without GST. Dont eat here if you expect to find a meal below RM20. I do not know why is it very expensive. A friend of mine said that, vegetarian or 'health food' cost more than the 'unhealthy' one but I do not see so healthy food here. Vegetarian supposed to be cheaper. Vegetables are cheap in this country, I do not know maybe in a very urban city where vegetables are rare but this is Sabah! Malaysia! An agriculture country is it not? Forget it, we end up there and the meal was not bad at all. I am just complaining about the price but the taste of their food are quite good actually. 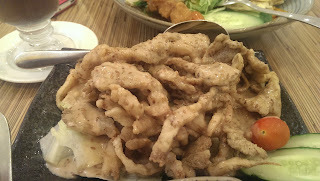 This mushroom fried with sesame dressing is one of my favourite. 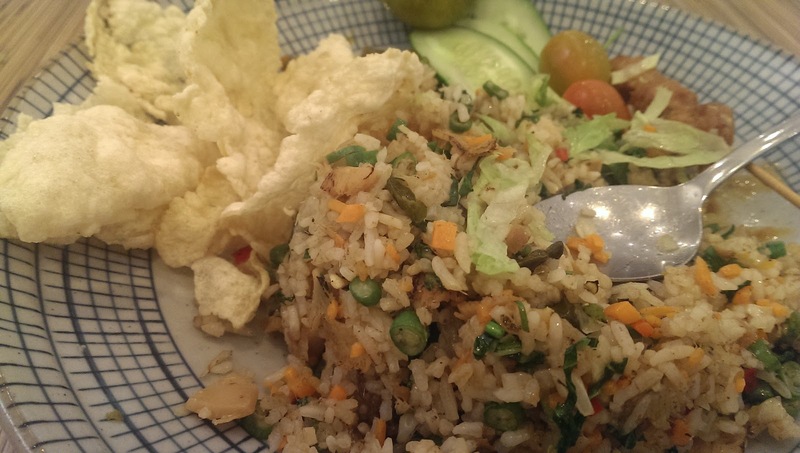 Sweet sour, savoury, crispy... It just explodes our taste buds. My wife orderd teriyaki Soba. 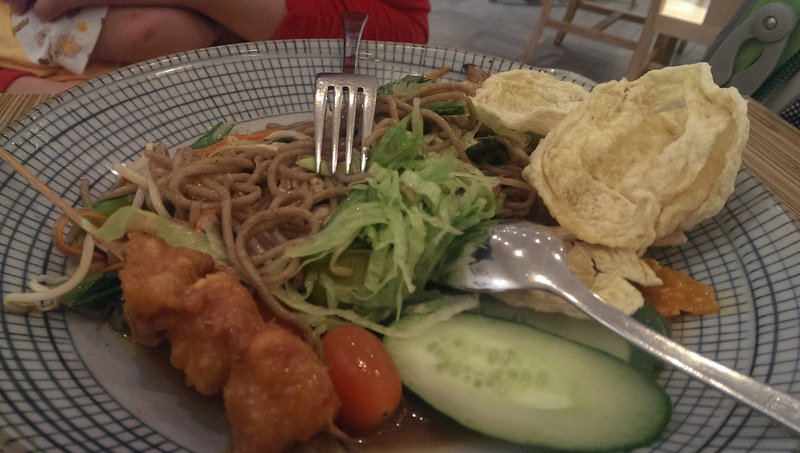 Sour fried soba. I prefer the one in the real Secret Recipe with that strong soy sauce flavour. This one a bit different. My beyond veggie fried rice. It was ok. Too many flavour in one dish, for me I am a bit confused with it. There were sweet, spicy, sour, bitter, i do not know. Maybe they should focus on one taste only, I just did not enjoyed the multiple taste dish like this. 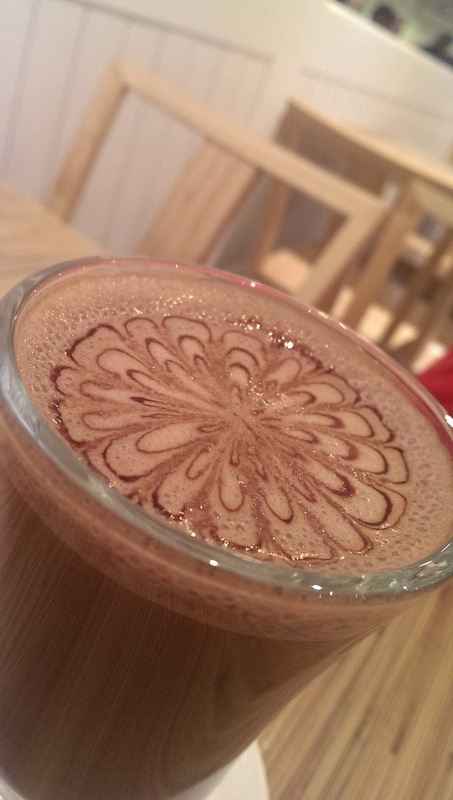 Hot chocolate. Love the decoration. Unfortunately our daughter cried, I think she was tired hungry or something. My wife end up eating hald of her food and we had to pack /tapau the food home. Beyond veggie may not be our preference, but for those who love mushroom, they cook their mushroom well in this place. Don't forget to fill up your wallet or maybe get your credit card ready before eating here. Kedai Tayar Putatan: Looking For Tyre in Putatan. MAS ticket to Labuan OVERPRICED!! !